24x7 Car Lockout Assistance You Can Count On! One of the most uncomfortable feelings is to be locked out of your own car. You’ve lost or misplaced the keys or even left them in the ignition, but since the doors locked, you can’t get your keys. You’ve got a problem; you just experienced one of the thousands of car lockouts that occur each year. There’s no way to resolve this problem unless you have a spare set of keys. But, even this becomes a problem if you’re miles from home or you don’t have a set of spare car keys. Your next and only option is to call an automotive locksmith. 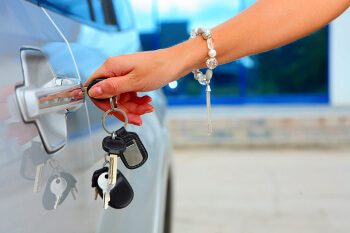 If you lost your keys while driving in the Dallas-Fort Worth area, call Dallas FW Locksmith. You’ll need car key replacement services ASAP. Our mobile locksmiths will arrive at your location within minutes and you can get both your car doors unlocked and car key replacement on-site. It’s easy, just call us and before our expert technicians complete their fast and friendly service, we’ll make sure you are comfortable with the process by giving you up front pricing. Our 24x7 locksmith service is staffed with fully trained locksmiths averaging 5+ years of experience. We are licensed, bonded, and insured locksmiths offering a 30 min response time for all calls. Our fast and friendly service begins from the moment we answer your call and doesn’t end until the lockout call is completed and our technician drives away. Our mobile locksmiths rush to your location in our fully stocked vans. Upon our arrival, we assess the situation and immediately get to work. Because each automotive locksmith is a trained expert, the Dallas FW Locksmith van is always stocked with a full line of emergency equipment for unlocking vehicles and making new car keys. We also provide duplicates for your car keys when new keys are made. Within minutes of our arrival at your lockout scene, we will unlock your vehicle and make keys if necessary, making it possible to continue your day with only a minor disturbance in your original schedule. Because cars use many different types of locks, our locksmiths are equipped with the knowledge and skill to work with a wide variety of automotive locks. Our locksmiths are trained to work with cylinder locks using basic metal keys, electronic locks using keyless entry systems or transponder keys, and combination locks. Our key making machines are part of the equipment we transport from job to job, so we’re always ready to provide replacement keys to our customers on-site. We offer a complete locksmith service, so if it involves a lock, we can unlock it, repair it, install it, or replace it. We provide locksmith services for homes, businesses, vehicles, safes, file drawers, lockers, and more! Plus, we make every type of key. Our 24x7 locksmith service is just that, an available locksmith service that completes calls 24 hours a day, seven days a week. If you’re at work, on the road, on vacation, or just at the grocery store when you discover you’re locked out of your car, call us. We’ll answer your call and be on the way to your location in minutes. Car lockouts are a common problem we are called to resolve, and we have the expertise and equipment to ensure it’s done quickly and effectively. In most car lockouts, the driver just needs the car doors unlocked because the keys are still in the ignition. Still, in many car lockouts, the keys have been lost so the doors need to be unlocked and new keys also need to be made. In every situation, our Dallas and Fort Worth, TX customers get up front pricing so they know what to expect before they place the order. Call us and let us resolve your car lockout issue so you can quickly get back on schedule. Car Lockouts http://dallasfwlocksmith.com/car-lockouts/ 3.5/5 based upon 12 reviews.